At Sun Spot Skylights, we’re ready for anything. That’s why our factory-certified installation consultants carry the full line of Solatube products on their vans at all times. Want to get your new daylighting system installed today? We can do that. Eager to see all your Solatube Decorative Fixture choices? We can do that. Hoping to upgrade your system with a Daylight Dimmer? We can do that. 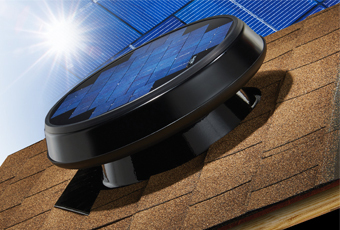 Get an instant $30 rebate when you have a Solar Star Attic Fan installed - save even more with a 30% tax credit. For all products purchased or delivered hereunder, Solatube International, Inc. warrants they are free from defects of workmanship and/or material for a period of time from the date of purchase as noted hereafter: Skylight components – 10 years; all other products (vent kits, light kits & motors)– 3 years, unless otherwise noted. Skylight components consist of skylight domes, roof flashing bases to which the dome is fastened, diffusers and diffuser ceiling mounts, reflectors, reflective tubing, plastic, rubber or metal seals, gaskets, tapes and fasteners. Should any product be determined by Solatube International to be defective, at the option of Solatube International, such products shall be replaced or repaired and returned to Buyer free from defect. Buyer shall give notice of any such defect to Solar Concepts within (30) days of discovery of such defects. Solar Concepts stands behind its warranty 100%. We will correct any installation deficiency within (2) years of the date of installation, any product related defects within (10) years of installation for skylight products and (3) years for vented, lighted and electrical products. Customer shall give notice of any such defect within (30) days of discovery of such defect. Warranty does not cover leaks which eventuate from a failure, deterioration, wear and tear of roof substrate, tiles, shingles, coverings, coatings or for any reasons that are not the fault of the installer. Warranty is void after reproofs or after any work which involves disturbing the products seal by any company or persons other than the original vendor. After the installer inspects the Solatube product, he/she will report the cause of the problem to the customer. If the problem is covered under the warranty, the installer will repair at no charge. If not, the installer will complete a service estimate that shows what the estimated charges will be. This is only an estimate and charges may exceed that amount. The customer’s signature on a service estimate will authorize the installer to proceed with the repairs. If the service call is product or installation related, Solar Concepts will repair at no charge to you. If re-roofing causes the need for repairs, having an unqualified person install the product or repairs needed are not the fault of product defect , Solar Concepts will charge for repairs that are performed at a rate of $75 per hour. Any additional parts or materials used will also be charge to the customer. Except as expressly set forth herein, the goods are provided “as is”, with out any warranty, express or implied, including but limited to all warranties of merchantability and fitness for a particular purpose; and any such warranties are hereby expressly disclaimed. In no event shall Solatube or vendor be liable for loss of profits, indirect, special incidental, consequential or other similar damages, including but no limited to any claim or demand arising out of the installation, existence, furnishing or functioning of any of the goods or use by any customer or third party of any product. In no event shall Solatube have any liability for any breach of warranty for improper installation of the goods to the fullest extent allowed by law, Solatubes liability to customers for all claims with respect to the goods shall be limited to the lesser of (A) the cost of replacing the goods; (B) the cost of obtaining equivalent goods or (C) the cost of having the goods repaired. To the fullest extent allowed by law, the liability of vendor to customer for all claims with respect to installation shall be limited to the lesser of (A) the cost of installation; (B) the cost of installing equivalent goods; or (C) the cost of reinstalling the goods. This contract contains all of the terms and conditions of the transaction between Customer and Vendor. No representation, arrangement, or agreement not appearing herein shall be binding on Vendor or Solatube International. This contract may not be altered or modified by Customer except by a writing signed be an officer of Vendor or Solatube International. This contract shall be governed by the laws of the States of California and Arizona, and customer hereby irrevocably submits the exclusive jurisdiction of the courts of the States of California and Arizona. The prevailing party in any action brought pursuant to this contract shall be entitled to recover all costs of such action, including without limitation, attorney fees. Unless as expressly set forth herein, Solar Concepts, authorized distributor for Arizona, Hereby declares that the Solatube Daylighting System installed on the date affixed on the attached invoice at the stated address of the purchaser, meets or exceeds all current Arizona state solar daylighting requirements as defined in ARS (sect. 42-1301, 44-1761). The installation has been performed by a qualified vendor who has met all training requirements of the state of Arizona. The qualified vendor’s business name, license number and signature are affixed to the attached invoice. The system warranty as expressed in the above statements of warranty meets or exceeds all requirements of the state of Arizona. The Solatube also meets all requirements to qualify for a solar tax credit (ARS sec. 43-1083). Whereas 25% of the purchase price may be used as a tax credit for installations after January 1, 1995. ARS forms 301 and 310 required for filing.